After much demand, I thought I would take it upon myself to write an essay on how to post your pictures and files on the ArmourArchive@HOME (members.armourarchive.org) space that has been so graciously offered by JT. First off, I will explain this tutorial using WS_FTP. The latest and greatest version, with lots of bells and whistles, can be downloaded from the official WS_FTP site. This is a trial version, which will cost $39.95 if you want to keep using it legally. Alternatively, you can download a version from TuCows (or other sites) which is freeware. The TuCows page for Windows is here. If this link doesn't work, go to the main TuCows site at www.tucows.com and then click through -- if it's not one of the most popular downloads, look in the FTP category of the Internet area. This version is freeware if you're a student, faculty/staff at a school, work for the government, or are using it at home for your own personal use. In addition to the main window/form shown above, a form should pop up saying Session Properties at the top. If not, you can access it by clicking the Connect button in the bottom left hand corner of the main form. Click New and all fields should become blank. In Profile Name type Armour (or whatever name/title you want to give to your session settings for members.armourarchive.org). In Host Name/Address type members.armourarchive.org as the machine address to connect to. For Host Type, pull down the drop-down menu and select Automatic detect (you can also select UNIX (standard) if you want). Now, hypothetically, let's assume my username is Bob01 and my password is BobPass. In the User ID field type in your username, in this tutorial's case, I would type Bob01. In the Password field I would type in BobPass; however, you would type in whatever password you selected or was given to you by JT. Since the ArmourArchive@HOME site doesn't use it, you should leave the Account field empty. If you want to put in a comment, feel free to do so in the Comment area. It will only be seen by you. 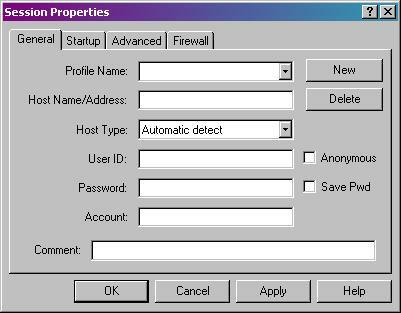 Then check Save Pwd if you want WS_FTP to save your password in its memory. If you don't check this box, you'll be asked for the password each time you connect using this profile. On the other hand, if other people have access to your computer, you're allowing them to connect to your web site as you if you check the box. Finally, click Apply along the bottom row, and then click Ok.
Just below the two file-browser window-panes of the main screen, you should see a bunch of IP addresses (numbers) fly by. Wait until it shows a number, and next to the number says Directory Send OK. You've just connected to the Archive's member web space! Double click on public_html and wait for it to say the Directory Send OK message again. This is your area to upload files to. The left hand file-browser window-pane has files on your local computer. Use it to find the file(s) on your hard drive that you wish to upload. Once found, click it/them (just like you'd click on on or more files in a directory-browser window on your computer, and click the arrow between the two panes which is facing right (like this: ->). Note 2: Most ftp servers, including the members.armourarchive.org one, will disconnect you if you don't do anything across the connection (e.g. upload, download) in 15 minutes. If you get disconnected, you'll see an error message when you try to do anything. Just click on the Connect button, re-connect, and do your file transfers a bit more promptly. To post this picture on the armourarchive.org Discussion Area I would go to my directory and click on pic.jpg. I would then highlight, and copy (Edit->Copy, Ctrl-C, or Right-Mouse-Button->Copy) the URL. I would then start a thread, or reply to an existing thread. This will show the text Click Here in your post, and when someone clicks the text, it will take them to the URL listed in the space between the quotation marks. You can change the text to something other than Click Here if you want. You can even put in an image-tag if you want -- for instance, if you had a large picture that you didn't want to force everyone to see, but also had a small version (both pixel- width and height, and number of bytes of file-size) that you wanted people to see, so they'd know what they were about to see. Doing things like this gets into HTML coding, which is beyond the scope of this essay, and beyond what the Archive is willing to help out with. Get an HTML primer, and learn how to create web pages and do other neat things. (Just don't get hooked on cgi-scripting, mySQL, PHP, JAVA, etc, because for the most part, the ArmourArchive@HOME space won't let you run those things. If you want to do that, you should really consider purchasing space and services from a professional web-hosting company. I hope this helps to allow more people to be able to upload their files properly! Organize the files that you upload into subdirectories of your public_html space. This should help you find things after a few weeks/months/years have passed. Set up web-pages that have links to other files in your ArmourArchive@HOME webspace. Configure the wsFTP application to automatically change-dir to your public_html folder, or to automatically start up in a particular directory on your local computer (in the Session Properties window, click on the Advanced tab. One of the fields will be "Initial Remote Site Folder", which would be set to /home/Bob01/public_html if your userName was "Bob01". Similarly, you can choose an "Initial Local Folder" to start in. Upload entire directories. If you select a folder to upload, wsFTP will ask whether you really want to upload the entire contents. The files will be copied down to your computer, where you can edit them, and then upload them again. Perform cleanup/misc operations on either your local, or remote, folders. Beside each window-pane browser there's a column of buttons to Change-Directory, Make-Directory, View, Execute, Rename, and Delete files, Refresh the window, and give you Directory-Information. There's a huge number of options that can be used to configure wsFTP. Be careful what you change, and if you don't know what you're doing, read the help files, and remember what you did so you can undo it.